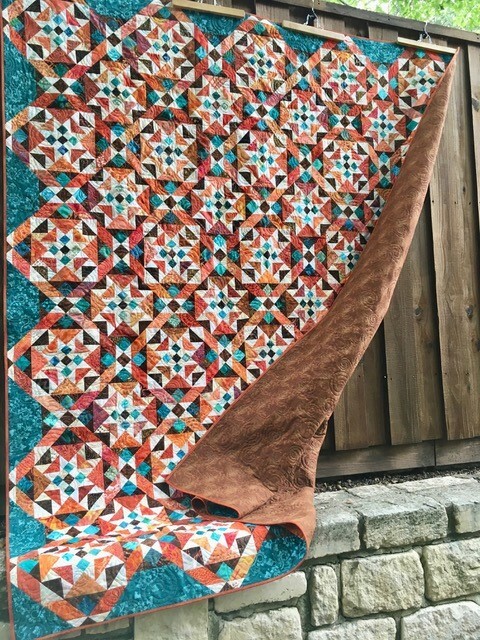 This entry was posted in Charity Quilts on August 9, 2018 by Jo. Your quilt turned out lovely in the end. I don’t participate in Bonnie’s mystery quilts. I don’t want to spend my time making a quilt that I may or may not like. I have to see the finished quilt then decide. Your quilt is lovely and I’m sure it will bring in a good amount from the raffle! You and Cheryl and Bonnie have done a fine job! Wow I know how much work that is as I have one waiting to be finished. Got all the blocks made, just have to sew them together. At a retreat in October. I hope I dont want to do this years mystery. It is all consuming. I love how it all started in NC, made a stop in Iowa but found a home in Texas! it takes a village sometimes. I wonder where it will find a forever home. It turned out so great! I wasn’t thrilled with my On Ringo Lake so I changed it. 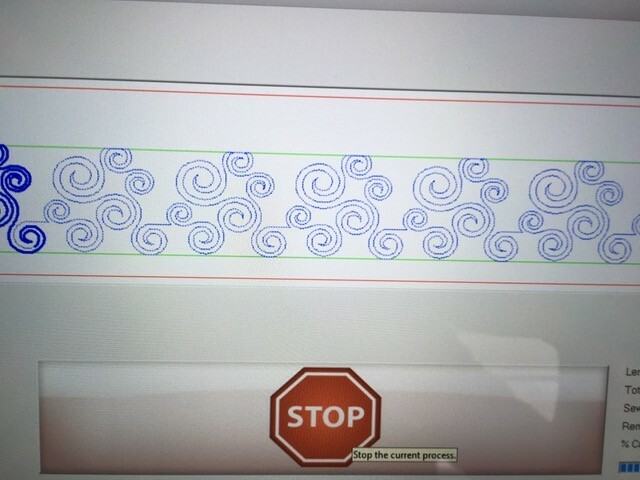 I left out the sashing and added a string neutral border. I gave mine to my brother. Another great quilt goes to a good home. 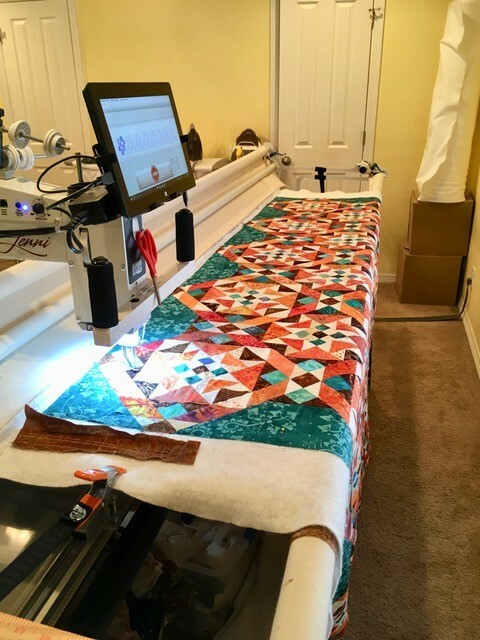 I love the colors on this one – and am so envious of Cheryl’s quilting ability and her machine! Good work – thanks for the close-up pictures. Wow, I can’t believe you passed that one on, too. Someone is going to be very happy winning it. It was a beautiful quilt! My own On Ringo Lake quilt is in a box somewhere. I got as far as Clue #4, I think. I am glad that other folks are finishing their tops. 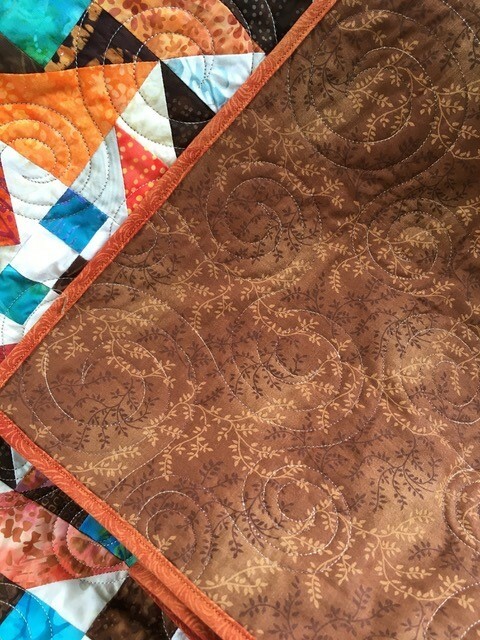 Jo, your readers are always such an inspiration when they write in describing quilts they have completed and given away. 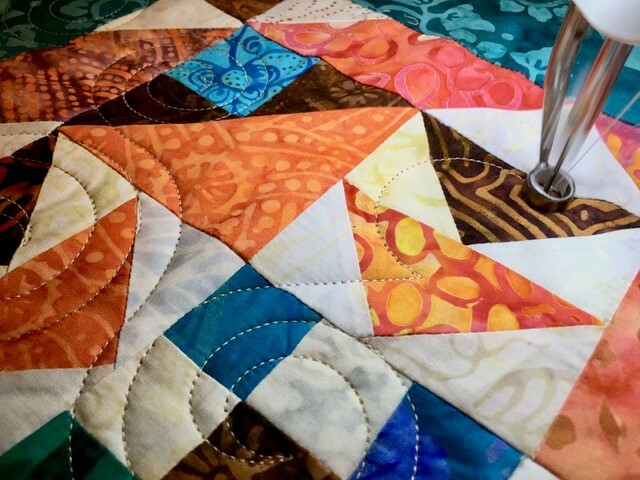 What a wonderful community quilters are! What brand of thread do you use in your longarm machine? The stitches always look distinct and the tension is perfect. Just wondering. Such a beautiful quilt Jo and Cheryl!!!! It would be so fun to watch the women before the raffle and to see the reaction of the winner!!! Your quilt turned out very nice. I have my blocks made, just need to put together sometime. I really like your backing material. I have the same material in a couple of different colors. From North Carolina to Iowa to Texas all made with love so those of us in Gainesville, FL can hope to win it. The last quilt Cheryl sent stayed in the arms of the winner for the rest of the auction. The monies from the auction are for Stonecroft Ministeries whose sole purpose is to bring hope and faith in God to women all over the country and the world. Thank you Cheryl and Jo for your labor of love. It is so very beautiful and so very much appreciated. 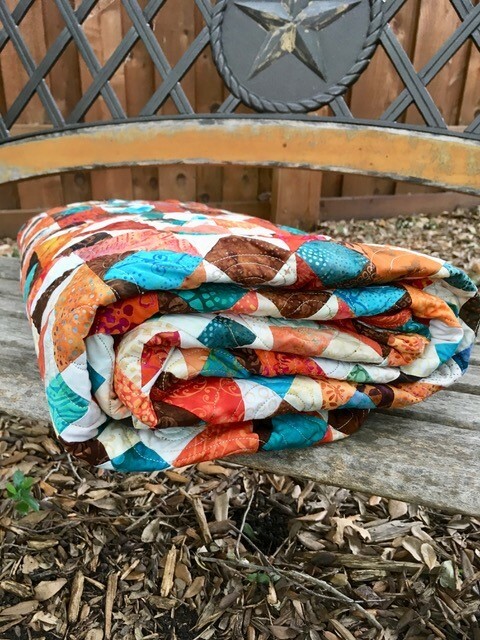 Your quilt turned out gorgeous! I can’t believe you’re not keeping it, although I’m sure that it will bring in a good amount of money. 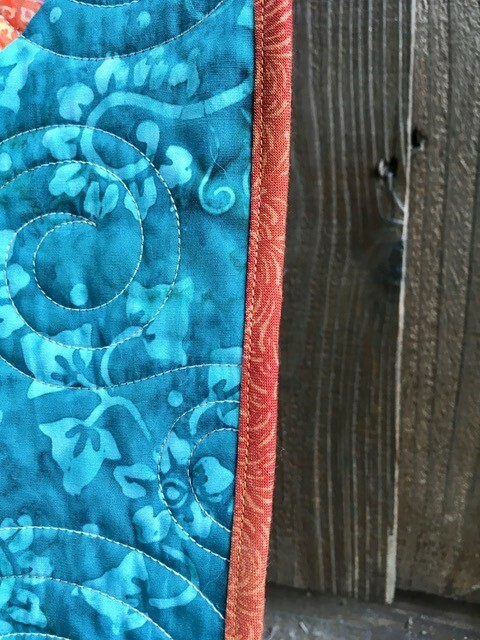 The backing does look perfect for it and I love the quilting design too. Your quilt is gorgeous! 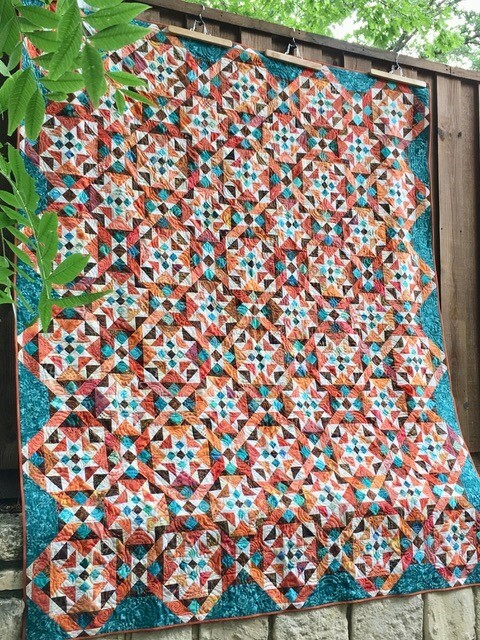 I love that quilting design! So generous of you to donate for a great cause! This is one of the prettiest versions of On Ringo Lake that I have seen! The colors are so vibrant and the brown backing is perfect for it. All of you ladies did such a wonderful job! 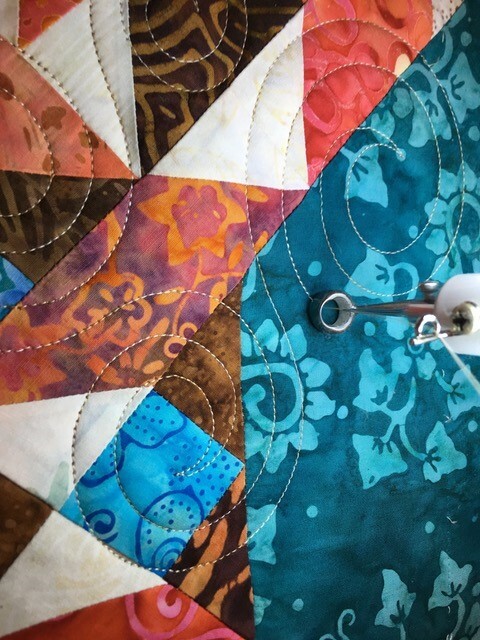 You have to really like piecing to make Bonnie’s quilts…they all have about a million pieces. I plan to make a few of them myself but they haven’t made it to the top of the list. I had back surgery in April and haven’t touched my machine since…hope to feel better soon. In the meantime, it’s EPP for me! I think it’s a beautiful quilt and lots of hours went into it…hope the recipient loves it!